*Plus applicable taxes and $9.00 shipping fee. 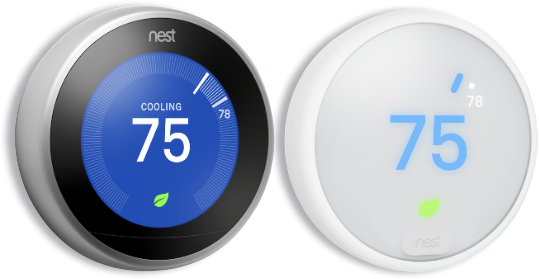 Magic Valley members qualify for exclusive savings on the purchase of a new Nest Thermostat. The beautifully designed smart thermostat that keeps you comfortable and helps you save energy. Already Have a Nest Thermostat? Nest and Magic Valley have partnered to help you save energy and get paid in the process. And, your Nest thermostat can do it all automatically. Earn money by participating in the Rush Hour Rewards program. Members who sign up for the program will receive a $50 MVEC bill credit, one per household. Members will receive a $25 MVEC bill credit each additional year they stain in the program. Saving energy starts with your thermostat. Putting in new light bulbs, efficient appliances, and unplugging everything when you leave saves energy… But, it’s a drop in the bucket compared to what a thermostat can do. Your thermostat controls half your energy bill. And it’s wasting energy unless you have a Nest. Don’t waste energy heating or cooling an empty home. Nest automatically saves energy when you’re away. much energy you’ve used in the last 10 days. How often do rush hour events happen? Rush Hours events may occur during the months of June through September. Members can expect to see no more than 36 events from June-September, but this number will depend on overall weather patterns for the season. Members will not have more than one rush hour event per day and can expect a maximum of three events per week. When can members expect rush hour events? Rush Hours events may occur between 1:00 p.m. and 9:00 p.m. on non-holiday weekdays and may last a maximum of two hours. Please note, you must have a NEST login set up and a Nest Thermostat installed before you can subscribe. Visit https://magicvalley.coop/rush-hour-rewards/, and click on the Sign Up button. Sign into your nest account if you aren’t already signed in. Select the home(s) you want to enroll in the program. Enter your Name, account number and address in the blanks. Read through the terms and conditions and check the box. Then click the “I’m done” button on the bottom of the page. Once your information is verified, Nest will send a confirmation email. This may take up to 2 business days. Tap “Setting” on the home screen. Go to Rebates and Rewards>Nest rebates and rewards. Then follow the same steps as above. Call a Customer Service Representative at 1(866) 225-5683 if you have any questions.